We have shown many times in the past how the U.S. debt bubble mushroomed in the boom that started in 1983. U.S. debt grew 839% in 25 years into the bubble peak of the first quarter of 2009. That was 2.68 times GDP growth. How can you have debt grow 2.68 times GDP and not have a debt crisis? Any economist that didn’t and doesn’t see that as a problem (think Paul Krugman) should be driving a limo instead. At least they could keep the suit that way. But as you would suspect, China makes that look like nothing. Just since 2000, or 14.5 years, China’s total debt grew from $1 trillion to $27.35 trillion or 2,635% while GDP grew from $1 trillion to $9 trillion. 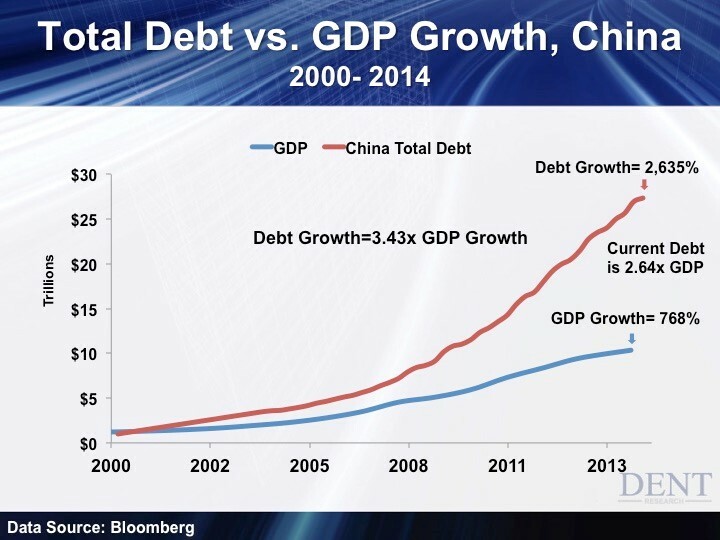 China’s debt grew 3.43 times GDP for 14.5 years. That has got to be the fastest growth rate of any major country ever. Yet many economists praise China’s new state-driven capitalist model. Yes, now governments can take debt and leverage to extremes that the free market system could never dream of… That’s a good thing? The U.S. and most developed countries have now taken over the economy and are setting short- and long-term interest rates at zero or less when you adjust for inflation and target growth and inflation rates. The central bankers want to run our economies like a machine as if it were an inorganic process when it is actually a very dynamic organic process that plays on opposing forces: boom and bust, innovation and creative destruction, inflation and deflation, and success and failure. That’s the secret to the golden goose of free market capitalism. Many investments will always fail, that is how we learn and evolve. But governments in a top-down and less accountable process will almost always make worse investments than the bottoms-up free market system. China now has 27% of urban homes vacant, excess capacity of 30% to 40% in major industries from cement to aluminum, and hordes of empty malls, offices, roads, bridges and rail systems. Real estate has gone up more than seven times since 2000 — does that sound like a bubble to you? The U.S. real estate bubble was a mere 2.2 times. The government has suddenly pushed 220 million unskilled people from rural areas into urban areas where they’re not even registered citizens. What happens to these people when the bubble bursts? China is going to finally prove once and for all that top-down, centrally planned economies are far inferior to bottoms-up free market ones. Russia wasn’t enough proof for clueless economists. They’re going to have to eat their words on this. You could look at China’s debt to GDP ratio of 2.64 times versus that of the U.S. and say that’s not as high as us at 3.54 times. But emerging countries have much lower debt ratios than developed ones as their consumers have much lower incomes and are much less credit worthy. China’s debt ratios are more than twice that of similar countries like Brazil or India. China’s capital investment from the government has been far higher and has lasted far longer than any other emerging country. This investment and debt binge is truly unprecedented! The best comparison with the U.S. would be to compare China’s debt growth for a similar time frame into the peak of the U.S. bubble, or 14.5 years from the third quarter of 1994 into the first quarter of 2009 as the chart below shows. China’s total debt grew 8.74 times as fast as U.S. debt in 14.5 years. Holy crap, we have no idea what a debt bubble is! China will NOT have a soft landing. It will fall like an elephant. Those 220 million people that they forced into urban areas are screwed. They will be jobless and likely not even have the option to go back to their rural farms for self-subsistence as those areas have now been paved over with empty condos. At least they’ll have those empty condos for squatter rights. We’ve also been warning that the Chinese government will start restricting the growing exodus of the most affluent Chinese (the smart money getting the hell out of Dodge). They just announced a crackdown on taxes owed for foreign income. The next step could be restrictions on leaving the country without a major exit tax. We are about to witness the greatest economic and social disaster in modern history.